Apartments with Alm-atmosphere for 2 to 4 people. The equipment is high quality; small kitchen with dishwasher, large need for a quick bathroom and separate WC, 2 bedrooms, balcony or Terrace with wonderful mountain views. The furniture is made from Stadelholz and provides a cozy atmosphere. Visit Berchtesgaden during the Advent season! Experience Gargantuan Christmas market and a wealth of tradition in Advent. In the festive season, it is especially nice to see the mountains of Berchtesgaden. The pictures shown here do not do the spot justice. You have to see it to believe it. The location is out of the way of the busier areas but still within a short bike/car ride to everything. The hosts are friendly and helpful the delivery of fresh bread every morning was a great touch. The Apartment is everything you want. Clean, well supplied, and furnished with a view that is unmatched. I highly recommend and we are already planning another visit with a longer stay. Our family of four really enjoyed the farm atmosphere, the surrounding mountains and the authenticity of the experience! The flat was meticulously cared for, clean and very comfortable. The owner, (Sebastian) was welcoming and helpful. Thank you for the nice review. It will be a pleasure for us, if your family will come again to our flat. Amazing views and extremely nice!! We would stay here again and recommend it! This is a working farm with charm and a setting that is unsurpassed. Lots of space including 2 bathrooms. It has rustic charm while still meeting every need. The owner's are gracious hosts and leave you to do your thing. Entrances are private and there is a bread service if you want it. Cows with cow bells roam around the picture perfect location and sound like wind chimes. The views can not be described. The pics are accurate and this is our new "go to" when in the area. We are pretty fickle, but we adore this place. Wifi, and coffee was all we needed to make it all perfect and 5 mins to town or 20 to Salzburg. Zuper! On this place for us no single wish remained open. This is a very well, comfortable, eye-friendly designed and spacious apartment. Wherever you look, you will like what you see. The equipment is cosy, modern and mint in every aspect (oiled wooden floors, wooden beam walls, spacious daylight bathroom, additional separate toilet, internet (wired and wireless) in each room, regional and international satelite TV channels on two flat screen TVs, kitchen has everything you will need and could wish for, ample cosy seating, four fresh and comfortable beds with excess length). Watzmann-View from balcony is amazing. The whole peacefull atmosphere means pure relaxation for mind and soul. Sebastian and Martina, the owners, are casual, friendly and open minded people. You'll enjoy beeing with them. They are rightfully proud on their neat and genuin Bavarian estate on which we can only congratulate! 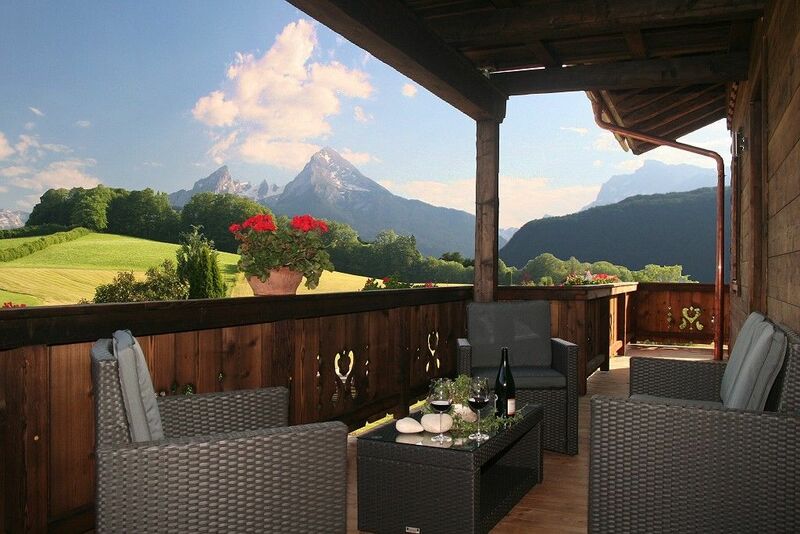 PS: The Alpine Berchtesgaden contryside is one of the finest – even worldwide considered. Thank you for this nice words! We hope to see you again in Oberreit! I have always liked this part of Bavaria and I have been looking for a peaceful place where you can just relax and enjoy peace and quiet. I have found such a place! The apartment is very spacious, has modern fixtures, flat screen TV's, very functional kitchen and pretty much everything you need to make a meal. What you see in the pictures is exactly what you get, a warm cabin feel with all the modern amenities. The owners were very nice and friendly, the place was very clean, it was just perfect, I could not have asked for more. If you like freedom and space then this is the place for you! The location is ideal, it provides peace and quiet with beautiful scenery, yet you are within 5-10km (most of the time 5km) from anything you really want to do (Jenner, Eagle’s nest, Konigssee). Salzburg is about 20km away plus many other little towns are not far. There are 5 grocery stores within the same distance so it is easy to make quick trips from place to place. You will definitely need a car, but it’s easy to drive and plenty of parking everywhere. I told the owners I will be coming back!!! Thank you for a wonderful place to stay!!! Thank you for this words! I hope you had beautyful days in Berchtesgaden! Berchtesgaden, one of the most beautiful alpine regions, located in the southeast of Germany. Our idyllic located property is surrounded by lush green meadows, between Berchtesgaden and Bischofswiesen in a conservation area. Nearly all the mountains of Berchtesgaden as Watzmann, Jenner, the Eagle's Nest and many others you can see from us. The magazine 'The Mountaineers' entitled A double-sided photo of our farm as 'The Alpenidyll par excellence'. Berchtesgaden Salt Mine, Jennerbahn, Eagle's Nest and the world-famous church of St. Bartolomä am Konigssee can be reached in a few minutes. The cross-country skiing and hiking center Aschauerweiher and dazugeörige pool can easily be reached on foot.